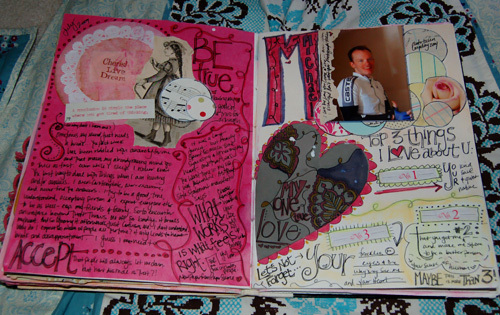 besottment by paper relics: This Weeks Journaling - Fixed! This Weeks Journaling - Fixed! Remember this page from my last weekly update? with the awful A in Michael? Well I fixed it! Behold - some circles, a cute picture and viola! no more ugly messed up A. I do have to admit I was about to gesso over it, but when I opened the gesso it splashed out and got on the spread (you can see if you look close) and I figured that was a sign I should not move forward or I would make a bigger mess so I changed my game plan and went with good ol' circles - added a photo, some old paper where I wrote about the photo and wrote michel in the leg of the M.
You can see I also added some circle to the left side as well (I couldn't stop myself!) Anyway, now I am much happier with this page. You did good...I wonder, if when the two of you are old and gray, you will remember the mistake or if the page will look as it was always intended to be? It looks like you planned it. 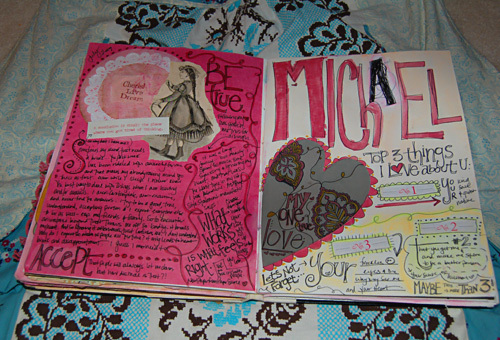 Hi Hope, your journals are so beautiful and creative! Spectacular! I love how you let us into your process in this post about the "naughty A". Isn't that what's great about paper?- Unless you tear it into shreds, you can salvage just about anything.